If you are a visitor to Australia and already within the country, Frank Overseas Visitor Health Insurance might be the best coverage to switch to–and it is easy! This visitor health insurance is a subsidiary of GMHBA Limited and just happens to be one of the more mature health funds within Australia. Currently, Frank Overseas Visitor Health Insurance carries 250,000 members. The company is located in Victoria, Australia and consistently services policyholders across all of Australia. Visitors searching for optimal in country coverage will find Frank Overseas Visitor Health Insurance ranking far above competitors. This is one of the fastest and cheapest ways a visitor to Australia can arrange health insurance coverage while in country, and it meets all working visa requirements as well. Frank is able to offer visitors cheaper insurance rates because it is a “not-for-profit” insurance provider. This means that this health plan does not have to fund any shareholders at all. Additional revenue gained is recycled back into the company through reduced prices and improvements to the benefits of the policy in particular. Frank Overseas Visitor Health Insurance & coverage also provides for private hospital coverage if it is deemed necessary. This is a unique feature of Frank Overseas Visitor Health Insurance, and the best news is that this additional benefit can be used at any hospital within the country. The policyholder does not have to go to any specific medical facility, which saves a great deal of time and reduces the worry that can ensue in such a circumstance. To clear up any confusion concerning “private hospital coverage” let’s explain it a bit better. Private hospital coverage allows an individual to seek out medical care from any private facility of their choosing for no extra charge at all. While this is an asset for individuals, it is a critical element for families within Australia. The fact is that there are many hospitals that do not provide the standard of care visitors might be accustomed to. Clearly, Frank Overseas Visitor Health Insurance does carry some hefty positive reviews that make it admirable in the face of competitors! These reviews are from existing/past policy holders and come from Australian health funds, which offer visitors a deeper insight on their options–all from a leading review website product review that is wholly trusted. Just as many other 457 health insurance policies meet all requirements set aside by the Dept. 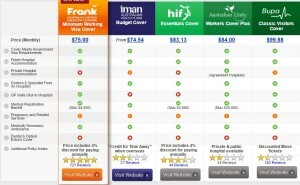 of Immigration (compared on this site) Frank Overseas Visitor Health Insurance does the same. This coverage meets requirements that are directly relative to condition 8501. While this meets the minimum standard of a specialist health coverage policy, it is also fair and extremely well-balanced. The Dept. of Immigration ranks this ‘adequate health insurance’ as per 8501 requirements of the 457 visas. Now it’s time to turn the page and look a bit at the potential disadvantages of Frank Overseas Visitor Health Insurance. While Frank has a $500 excess per person on the policy, it doesn’t diminish the quality of your care. This simply means that you’ll be required to pay that initial $500 expense during your hospital stay. This does have an annual cap, so you’ll never be required to pay the excess for multiple hospital visits. Those interested in this coverage should also be aware that while you can go to any Australian medical facility (and private hospital) the fixed benefits will only be paid to those private hospitals that are non-participating. In other words, if you stay in network and choose any one of the 460 private hospitals or day surgery facilities where agreements exist, you won’t receive the fixed benefits. Now, if you’re totally fine receiving treatment within a public hospital and/or sharing a room with another patient, HIF may be a better solution (although you might find the coverage a little more expensive). A striking difference you might find with Frank (unlike other visitor health care coverage firms) is that it offers a cheaper 457 visa health insurance policy/policies. This might be unfavorable to some visitors, especially if they are seeking premium coverage for stays in private hospitals, for conditions like pregnancy. In this respect, there might be a preference for a different Australian health fund. Who Is Best Suited For Frank Overseas Visitor Health Insurance? If you’re a visitor to Australia satisfied with being treated in a public hospital, and you want to avoid paying excess fees, then HIF may be totally satisfactory. Remember, Frank Overseas Visitor Health Insurance is not designed for a ‘not for profit’ health plan like HIF is. But, this is exactly why the prices can be lower. It might also be one of the reasons why great reviews come in about it.